Every year the world's greatest cycling event - the Tour de France - visits the tough mountain climbs of the Pyrenees. Usually that includes one of the major Cols within spitting distance of Villa Tamerza. 2016 saw the Tour pass over the Col du Tourmalet and the Col d'Aspin, cycle routes to both of which can be enjoyed from Villa Tamerza. The mountains lie to the south, west and east of Bagneres-de-Bigorre and there are countless well-known and less well-known cols to be tackled. To the north towards Tarbes or Pau, the countryside is much flatter, so the easier routes are in this direction. There are also lots of mountain bike trails. You could stay for a month and do different rides everyday. 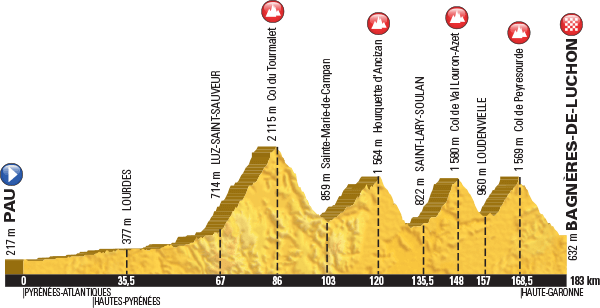 There are a wealth of Hors, First and Second category climbs for the brave (foolish? ), as well as loads of nice flat rides through the surrounding valleys and picturesque countryside. For elite riders, the 'must' cols are the Col du Tourmalet, Col d'Aspin, Col d'Aubisque, Col de Peyresourde, Plat d'Adet, Col du Soulor, Col de Marie-Blanc and the Hautacam - but there are many others - all within riding distance of Villa Tamerza. The Col du Tourmalet is one of the longest mountain climbs you are likely to encounter - nearly 23 km from Campan to the top. The last 14 km are fierce, averaging around 8-9%, but with steeper patches just to keep you awake! It takes about twenty minutes to ride to Campan from Villa Tamerza. After about 3 km you reach St Marie de Campan where the road forks. Veer to the right to carry on up the Tourmalet or go straight on for the Col d'Aspin. The Tour de France typically includes one or more sectors in the Pyrenees and some of the main sections are within a few minutes of Villa Tamerza. Indeed, it is not uncommon for the Tour to pass by the Villa. 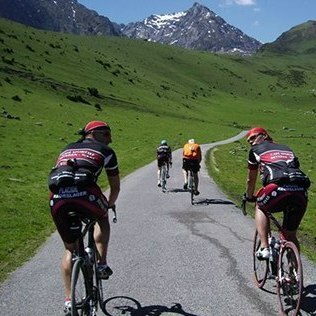 Many keen cyclists, including cycling groups, have visited the Villa to enjoy the famous cycling routes on our doorstep.